Just a heads up that sadly, this year we will NOT be having our yearly calendar photo contest. It's been a long time tradition that I know many of you look forward to each year. Marty has some personal stuff going on and simply won't have time to do it. I hope things get better for Marty! All the best to Marty!! Hi to all at Riverside Reptiles. 'T'is a shame about the calendar ....and, as a newbie to the site, was quite excited when I saw 2015 calendar. This site is awesome, and I'm enjoying every nanosecond that I get to jump on. Thank you to all of the behind-the-scenes workers who tirelessly update and organise this wonderful opportunity. Cos that's what it is. 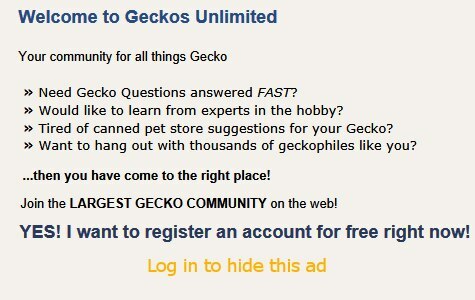 An opportunity.... To chat, learn, share, celebrate, console, with other gecko-minded souls, all around the world!?!! On a personal note..... Marty, I hope this begin to morph into what you are seeking. One important thing I have learned is that YOU have to look after YOU.... cos nobody else is gonna care for yourself and your family like YOU. THANKS AGAIN TO ALL. Wishing Marty all the best.